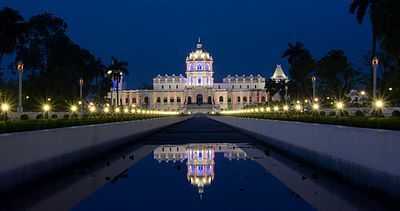 Agartala (Bengali: আগরতলা, Agort̪ɔla) is the capital of the Indian state of Tripura and is the third largest develop city and municipal body in North-east India after Imphal. The city is the seat of the Government of Tripura. Agartala is one of the fastest developing cities of India. There are 8 police stations and 9 legislative assembly constituencies covering various parts of the city. Agartala is a derivative of two words, namely Agar, a valuable perfume and incense tree of genus Aquilaria, and the suffix Tala, meaning underneath, a reference to the density of Agarwood trees in the region. The city is governed by the Agartala Municipal Corporation. Agartala lies on the bank of the Haora River and is located 2 km from the Bangladesh Border. Agartala is India's third international internet gateway after the ones in Mumbai and Chennai.